Fund for Assistance to the ROCOR - Take a pilgrimage to Uganda from the comfort of your home! Wooden chapel on Bukasa island. photo: Alexannder Pomnikow. You are invited to take a pilgrimage to a unique church on Bukasa Island, Uganda. You can click through this amazing panorama and listen to Liturgy served in a local language. The wooden chapel was built by Fr Christopher Walusimbi, who heads the small ROCOR mission there. FFA has been supporting Fr Christopher for several years. For more information, please click here. 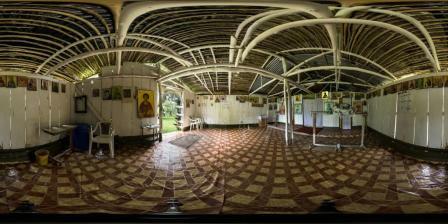 The wonderful panorama was done by photographer Alexander Pomnikow, who regularly visits Fr Christopher in Uganda. To read about his recent visit, please click here.